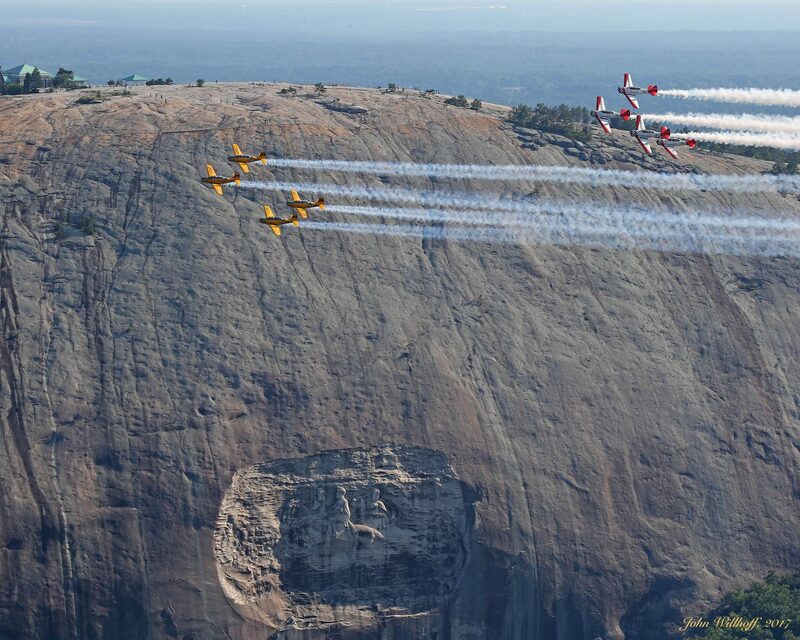 This picture shows the Lima Lima Flight team with the Aeroshell flight team over Stone Mountain near Atlanta Georgia last month at the Good Neighbor Airshow. In my humble opinion, these are the two best four-ship teams in the world. Both have been in the airshow business for over thirty years. Thanks to John Willhoff for the great air to air shot. ATLANTA, GA — The precision flight of the Lima Lima Flight Team performed over the Good Neighbor Day Airshow on Saturday exciting huge crowds in attendance as they witnessed the maneuvers performed by the pilots of yesterday and today. 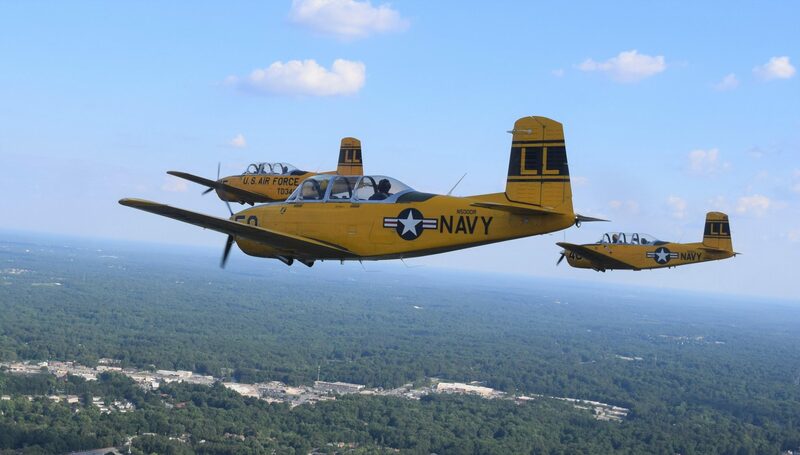 Their four yellow Beechcraft T-34 aircraft soared over the Peachtree-DeKalb Airport on June 10 as they transitted from right to left before the crowd as the lead pilot radioed “smoke-on”. Seconds later, the team began their climb into a forty-five degree angle straight up aginst the cold blue sky. It is their diamond formation — four planes flying as one just a few feet apart — which gave over 12,000 guests reason to applaude and cheer. Designed by Walter Beech in 1949, the Beechcraft T-34A was built as a primary trainer for the Air Force and Navy as the jet age began. The Air Force contracted them right away and flew with them during the 1950’s. Meanwhile, the Navy continued flying the T-34 until 1972. Today, the military and even NASA use the single prop aircraft for different reasons. The team’s origins began forty-one years ago, thrilling crowds with formation flying in the midwest of the United States. Today, they are slowly performing at new show sites on the east coast and the southeast. Fritz, who joined Lima Lima in 2013, added this was their first visit to Atlanta, and they look forward for a possible return trip next year. The four pilots for the 2017 and 2018 seasons include lead pilot Skip “Scooter” Aldous, Steve “Hoss” Smith, Mark “Enigma” Miller, and “Fritz” Fritzler. All four pilots carried early asperations of wanting to fly during their youth — three of them later entered military service and piloted top military aircraft. As the four pilots stood together in conversation, they carried a tone of excitement as the prepared for an afternoon flight. Each with a positive tone about flying, discussing with a few airport officials how stongly they want to encourage today’s youth about the many fields of aviation. Scooter added that the team performs every maneuver before the crowd at each show. From take-off to landing, Lima Lima stays in front of the guests in attendance. 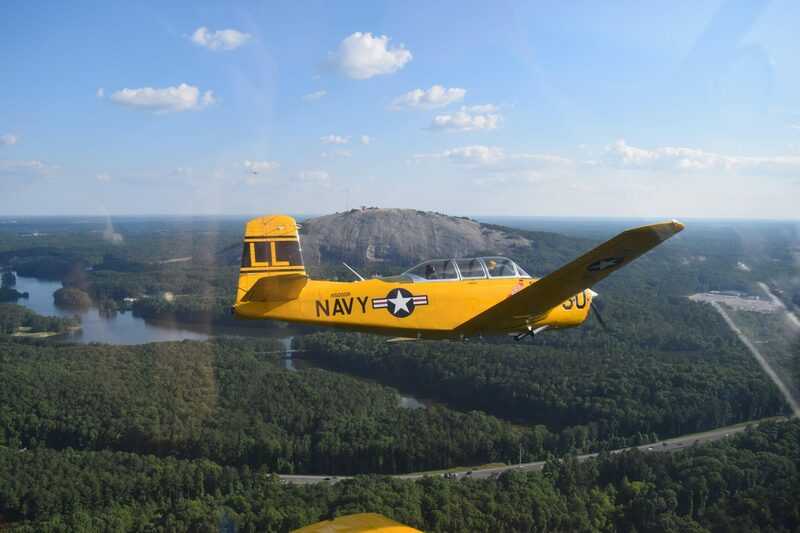 During the airshow weekend, the four pilots of Lima Lima joined with their brothers of Team Aeroshell to perform an eight plane close formation flight over Stone Mountain. The historic Georgia landmark is located east of Atlanta and just a few minutes by flight south of Peachtree-DeKalb Airport. Following a preflight briefing between the two teams, Lima Lima took off first in finger tip formation from runway 21, gained altitude, and Fritz then maneuvered his number 4 aircraft into the slot position to form the diamond. Aeroshell then departed two minutes later and manuvered in the same fashion to form their own diamond. 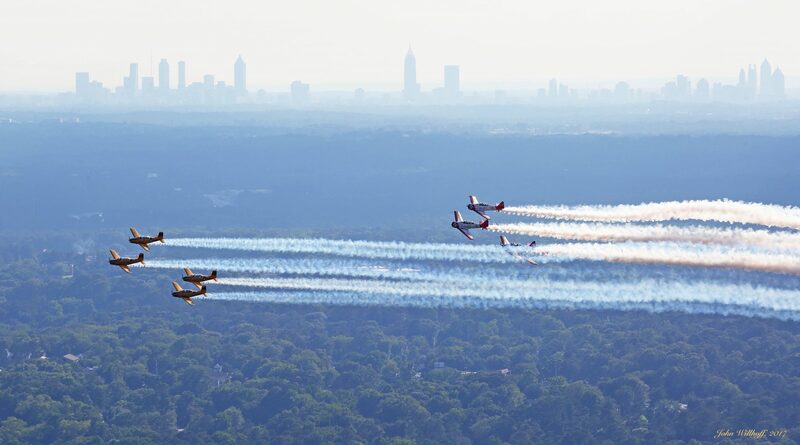 This aerospace journalist flew along with Fritz to record the rare event as the two aerobatic diamonds flew in formation with the skyline of Atlanta in the close distance. Great weather greeted the aircraft as two teams set up for the formation over the park. Following one practice pass in front of the massive granite mountain, the Lima Lima Flight Team and Team Aeroshell went smoke-on and performed a beautiful pass before Stone Mountain. On the headset, the pilots of each team were calm, but as the teams separated from one another the conversation was one of ecstatic chatter and goodwill.